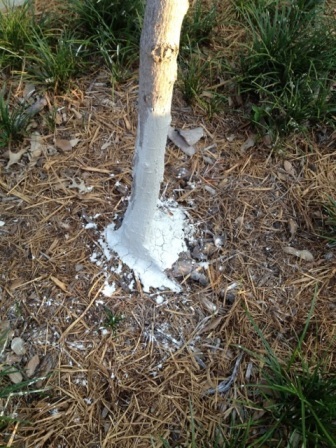 When pruning cuts are made on trees, I usually do not recommend pruning paint or wound dressing. There is considerable research and data showing that this procedure is more detrimental than helpful. Pruning cuts heal faster and more correctly if cuts are left exposed to the air to heal naturally. However when tree trunks or limbs are damaged by equipment or other factors, I do recommend using what is called Tree Trunk Goop. Here’s the formula. Mix equal amounts of diatomaceous earth, soft rock phosphate and compost together. Add enough water to make a thick slurry. Slather this wet mix onto scrapes, cuts, borer holes, ripped places or other injuries on trunks or limbs. Reapply if washed off by rain or irrigation. In the soil, the mix makes a good organic fertilizer. Fireplace ashes can be used if soft rock phosphate isn’t available. Minor wounds and wounds going only partially around the trunk heal easily with this procedure. Trees totally girdled are much more difficult to save. Listeners and readers have reported being successful with totally girdled trees and have even sent photos proving it. I didn't think it was possible before, but now I do. For total girdling, burlap needs to be soaked in the Tree Trunk Goop and then wrapped all the way around the damaged trunk. Tin foil and/or plastic can be wrapped around the burlap to help hold the moisture in the mixture. I never have and still don't recommend wound dressings like tar and black paint products. They do more damage than good. But the Tree Trunk Goop mixture is different. It feeds the tree through the wounded area and helps damaged places heal quickly and thoroughly. If normal wound dressing must be used, for whatever reason, the product called Lac Balsam is the best on the market. It stays soft and resilient and allows at least some air to reach the wound.